This gorgeous two tiered cake is fully iced with lemon coloured icing on the top tier and blue icing on the bottom. A blue satin ribbon (with a bow) sits around the top tier, while a yellow satin ribbon sits around the bottom tier. 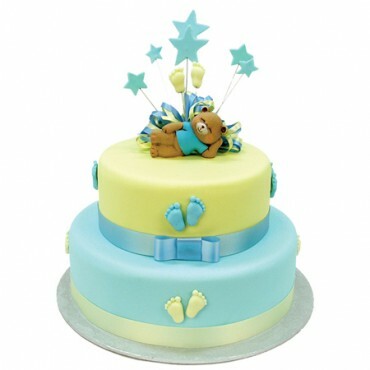 Each tier has contrasting coloured sugar baby feet! The cake is topped with a gorgeous hand painted teddy bear ornament sleeping amongst an explosion of blue sugar stars and baby feet on wires.